This IBM® Redpaper™ publication covers how to use the Cisco IBM VersaStack integrated infrastructure as a platform for IBM Middleware by using the IBM PureApplication® Software V2.1 product, which has the means to install, configure, and manage IBM Middleware on VersaStack. VersaStack can run many software stacks, and PureApplication Software can run on many integrated infrastructures. This paper gives specific design and implementation recommendations for integrating PureApplication Software Version 2.1 on to Cisco IBM VersaStack. Most of this paper focuses on PureApplication Software Version 2.1, but always in the context of VersaStack. 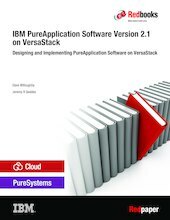 It describes and gives the business values of PureApplication Software, provides an overview of VersaStack, shows the preparation of VersaStack for PureApplication Software, gives some hints about installing and configuring the PureApplication Software, and describe how to use PureApplication Software to deploy an IBM Middleware pattern on VersaStack. The target audience for this paper is IT professionals who are responsible for designing and implementing PureApplication Software on VersaStack.